If you have considered introducing other languages to your child, here is an ideal starting block. 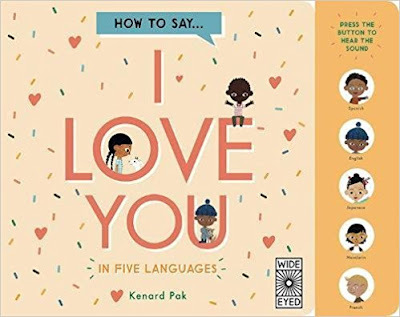 Regardless of the child’s mother tongue, this beautifully illustrated board book will teach them the simple expression I love you, in five languages including English. It is a way to awaken in children, an interest in the many cultures that make up our richly diverse population. Five children’s faces are visible along the right side of the book, with the language they speak written below. This strip becomes part of the whole picture as each page is turned. The list begins with English and follows with French, Spanish, Japanese, and Mandarin. A greeting by each child and a sentence which refers to the picture on the adjoining page is written in the specific language with the translation in English below. To hear them say the words in the chosen language, the reader simply has to press the picture of the child above the listed language. Readers are able to see and hear the words at the same time. I found this a stimulating way for children to approach a foreign language. George salutes with a greeting in English. He is standing in a field with his dog. Pierre is in front of the playground speaking to a friend in French. Gabriel speaks Spanish to the boy in the adjoining apartment from his window. Yukiko is Japanese. She is standing on a bridge with her mother. You can hear Yukiko say I love you in Japanese by pressing on her picture. Jia Jia, who loves playing soccer with her brother, speaks to him in Mandarin as they kick the ball. Attractively designed and presented, Kenard Pak’s illustrations of the characters on the front and back cover are a delight. The contents are accentuated by the bold lettering against soft pastel colours. As it is battery operated, it comes with a warning regarding the safety of children under three years old.